Whomp whomp. There're no Lions for sale. No courage? Think again, partner. The teeth alone on this vicious beast would strike terror into any mere mortal being. Height: 7 1/4 inches tall on base. Articulation: Neck (ball joint), shoulders, upper arms, wrists and waist. Total of eight points of articulation. Also has bendy tail and soft molded mane. Accessories: Base with integrated foot pegs, removable entrails, foot trap, spear, sword and dagger. 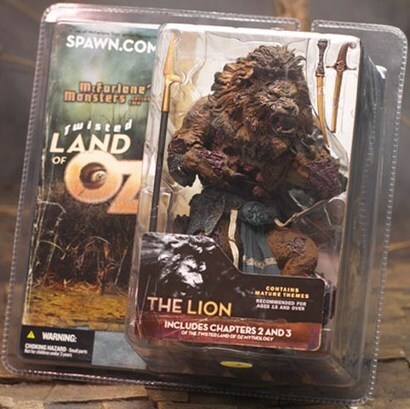 Packaging includes Chapters 2 and 3 of Twisted Land of Oz mythology.